Step 1 Squeeze the halves of 1 lemon into a large bowl filled with water. Step 2 Trim the artichokes: Hold an artichoke in one hand with the stem facing toward you and the tip facing away. Peel or trim away the tough outer leaves. Keep peeling or trimming until you've cut away enough of the tough leaves so that you see only light green at the base. Cut away the top half-inch or so of the tip of the artichoke and dip the artichoke into the lemon water to keep the cut surfaces from discoloring. With a paring knife, trim away the very tip of the stem, then peel the stem and base of the artichoke, going from the tip to where the base meets the leaves. When you're done, there should be no dark green tough spots left, only pale green and ivory. Step 3Dip each artichoke in lemon water to prevent browning, then cut in half lengthwise. Remove the hairy choke in the center of the heart (a serrated grapefruit spoon is easiest; a teaspoon will work too). Put the cleaned halves in the lemon water and repeat for the remaining artichokes. Step 4Peel the potatoes and dice them into one-half inch pieces. Place the potatoes in a medium pot with the quart of water, garlic, oil, harissa, juice from the remaining lemon, paprika and salt. Drain the artichokes and quarter them lengthwise (if the artichokes are large, cut them lengthwise into eighths). Add the artichokes to the pot. Step 5Bring the mixture to a boil, then reduce the heat, cover the pot and simmer until the artichokes and potatoes are tender, about 20 minutes. Step 6Strain the potatoes and artichokes from the pot into a serving dish or bowl. Bring the remaining liquid to a gentle simmer and cook until the liquid reduces to a glaze, 10 to 15 minutes. Remove from heat and pour the glaze over the artichokes and potatoes, tossing to coat. Serve warm or cold. In Recipes-list.com we have selected the most viewed recipes from category - Quick and easy Salads Vegetarian . Enjoy the best recipes specially selected for you! 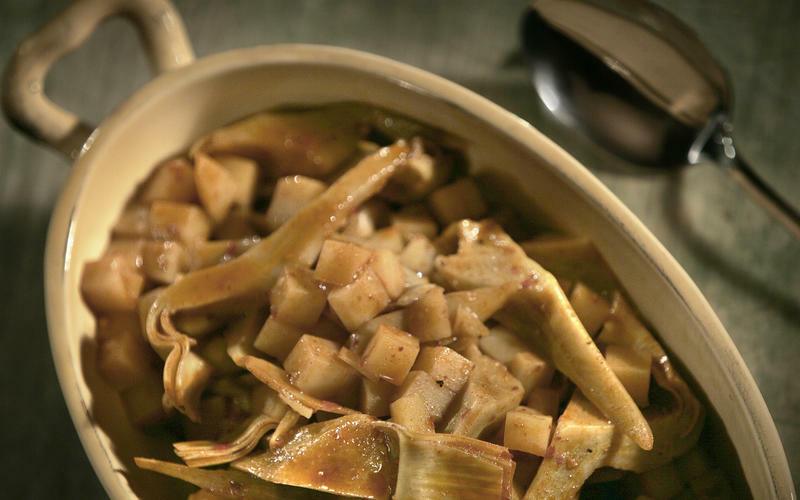 Artichoke salad with harissa is the right choice that will satisfy all your claims.